Coffee Morning – See you this coming Sunday! Join Pádraig in Marie’s house for the legendary annual gathering! Invite your family, friends and neighbours to drop by! 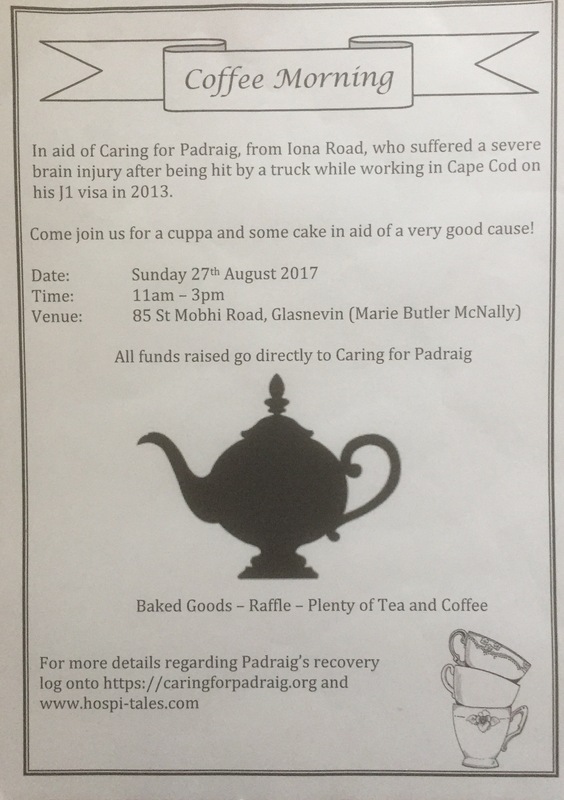 The coffee morning organised every year by Marie since Pádraig’s accident is legend. This year Pádraig will be able to meet all his friends and supporters for the first time in person. Please pass this invitation on to friends and family. Marie expects to have a full house and garden! The proceeds from this coffee morning have made it possible for Pádraig to avail of equipment, therapy and rehabilitation that he would otherwise not have had access to. The fact that he has recovered as much as he has is in a big way due to the tremendous support channeled through this annual gathering and the incredible effort Marie and her family have made.